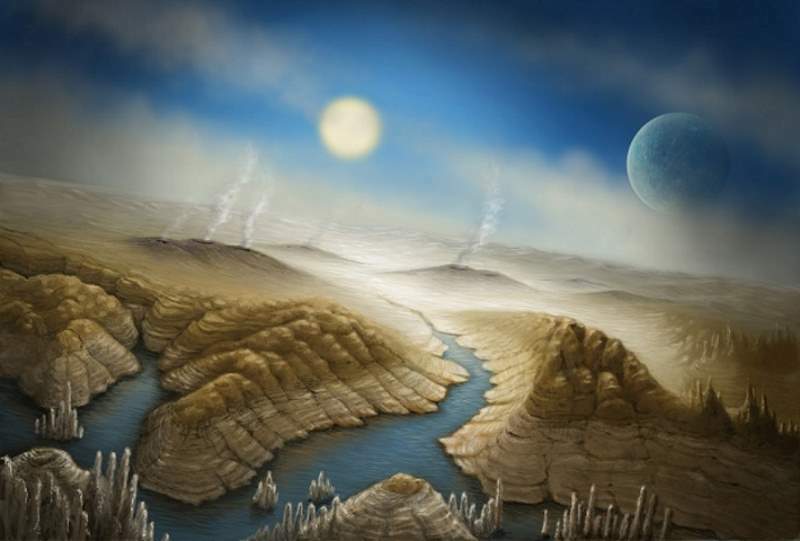 An artist’s impression of exoplanet Kepler-452b, which is likely to be rocky, just as Earth is. SETI Institute/Danielle Futselaar. 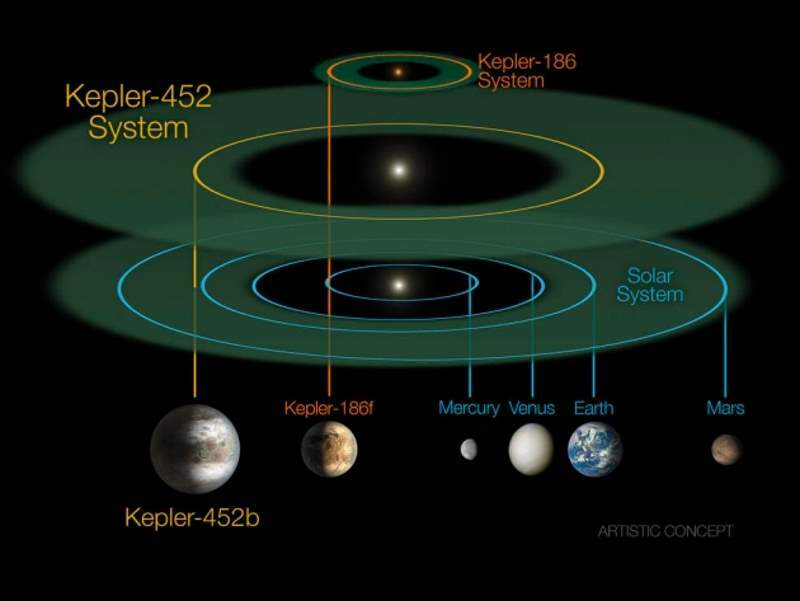 Kepler-452b and its star compared to the Earth and the Sun and previously discovered Earth-like exoplanets. NASA/JPL-CalTech/R. Hurt. A Kepler-452b year is 384.84 Earth days and the planet is 5% more distant from its star than our planet is from the Sun. This means, the new planet is definitely in the habitable zone. In astronomy and astrobiology, the circumstellar habitable zone – CHZ, or simply the habitable zone, colloquially known as the Goldilocks zone, is the region around a star within which planetary-mass objects with sufficient atmospheric pressure can support liquid water at their surfaces. The bounds of the CHZ are calculated using the known requirements of Earth’s biosphere, its position in the Solar System and the amount of radiant energy it receives from the Sun. Due to the importance of liquid water to life, as it exists on Earth, the nature of the CHZ and the objects within is believed to be instrumental in determining the scope and distribution of Earth-like extraterrestrial life and intelligence. The mass of Kepler-452b can’t be directly determined yet, but the scientists think it may be about five times that of Earth. This is not the first Earth-sized planet found in a habitable zone: for example, Kepler-186f, which discovered last year about 490 light-years (151 pc) from the Earth, is more similar in size to our planet. But it is orbited a red dwarf star, smaller and cooler than the Sun. We can’t know if there’s life on the planet, and probably we won’t know for a long time. But we’re on the track. John Grunsfeld, associate administrator of NASA’s Science Mission Directorate said that: “Kepler 452b is one small step in answering the question [of are we alone] today,”, in a press conference. Launched in March 2009, Kepler is the first NASA mission to detect Earth-size planets orbiting distant stars in or near the habitable zone — the range of distances from a star in which the surface temperature of an orbiting planet might sustain liquid water. The telescope has since confirmed more than 1,000 planets and more than 3,000 planet candidates spanning a wide range of sizes and orbital distances, including those in the habitable zone. Kepler is part of NASA’s Discovery Program of relatively low-cost, focused primary science missions.